I can’t believe there are only 2 weekends left until Christmas! Ahhh! There is so much left to do. Normally the hubs and I would bake cookies this weekend, but we have so much going on that there just isn’t time! But I don’t want to complain because everything we are doing is so fun and I am so blessed by the friends we will be spending time with! Tomorrow is our Franksgiving (aka Friend Thanksgiving) – we are having a few couples over from our Small Group and enjoying a delicious turkey dinner with side dishes prepared by different people in the group. It will be a great way for us to reflect on everything we are thankful for and look forward to the joy of Christmas and the coming of our Savior! My goal of this unit was for them to see how everything worked together to lead to American independence, and without the Lord’s help, we would not have made it through. Looking at the miracles that happened, such as Washington’s horse getting shot out from under him and he survived, or the foggy night that allowed Washington and his troops to safely retreat from New York after a battle, we can see God’s hand in all of it. Pretty amazing! Wanna see how much you know about the Revolution? Check out my unit test – you’ll be amazed at the knowledge these kids come away with! So now we can finally focus on Christmas, right? WRONG! It’s time to spend a week learning about the Constitution and the foundation of our country’s government. Blah. Don’t get me wrong, it’s an important thing to discuss, but at this point I am simply ready to put aside the heavy duty information and focus on advent! We will have a week of instruction before Christmas and finish the rest of the information after returning in January. But in the midst of learning about our government, we will also be talking about holidays around the world. 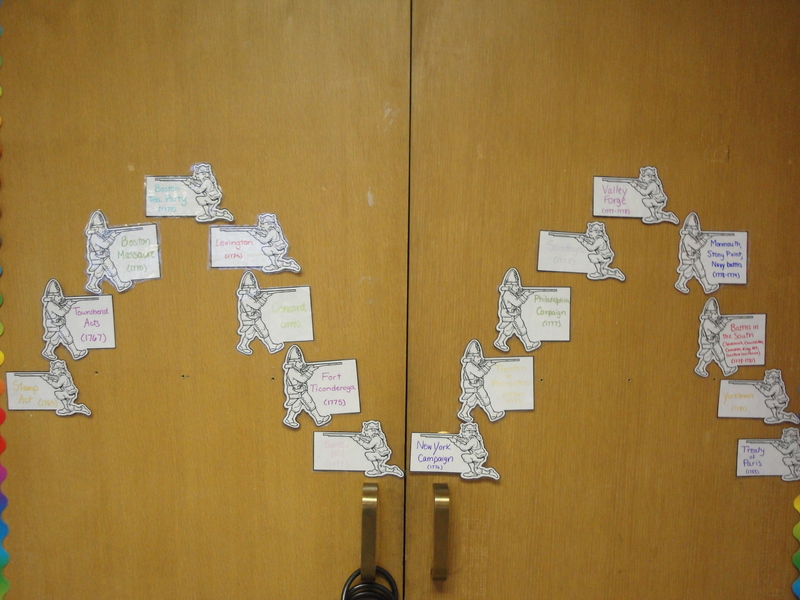 Each month, the students at our school complete a project that ties into the topic of that month. In November, my kiddos did their wax museum presentation. 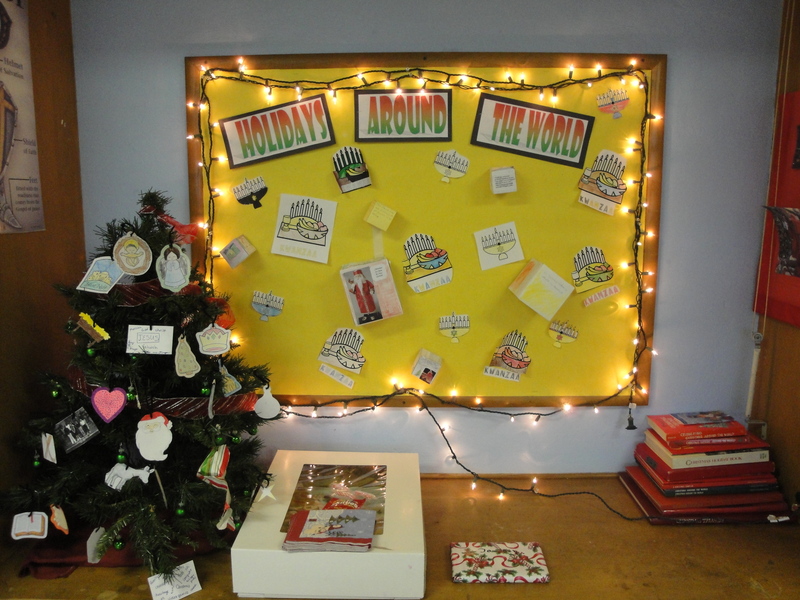 In December, we learn about holidays around the world, so each student picks a country and researches its holiday traditions. *BUT* instead of presenting in regular, report format, they create what’s called a “Box Report”. They take the information they learn and put it on the 6 sides of the box! This is a low-key, non-stressful project that allows them to have a little bit of creative fun with it! I allow them to use any size box, though I do provide them with a pattern for a box they can make, and they can decorate their box however they would like to. I’ve had some come in with large cardboard boxes, and others with itty bitty ones – but as long as the information is there, I don’t care how it is presented 🙂 The students then teach the rest of the class about their country’s holiday traditions. Holiday Box Report – Check out the guidelines that I created. This is my tree and bulletin board from last year. I hung their boxes on the board after they presented, using either masking tape or push pins. We also take time to study Hanukkah and its traditions, hence why there are pictures of menorahs on the board. 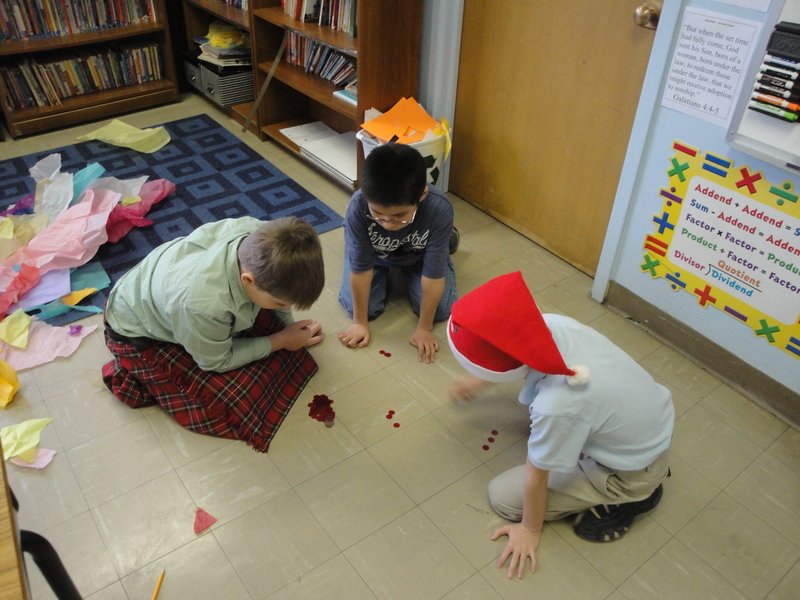 One of the students’ favorite things to do is play the dreidel game ! After playing it once, they always ask to play again. I have a few dreidels here that we use, but I also have a pattern that I found for the kids to make their own. What does your classroom look like for the holidays? Busy busy busy? Or do you take it easy and just have fun? I apologize for my lack of writing lately! I think you know how it is. Things are so busy. I mean, SO busy. I am currently trying to finish our unit on the Revolutionary War – I absolutely love this unit and I’m always sad to see it end! We always start the unit by talking about cause and effect, and how every event led to something else, and it all worked together to lead to the war, which led to the start of our country! One of the things that we do to help keep track of the events leading up to the war is create a domino chart that allows the students to see the events in order. Setting up some dominoes and showing how they all knock each other down helps the students visualize how one event led to the next. We then cut out pictures of 12 dominoes and glue them on a piece of card stock. As we discuss certain events, such as the Stamp Act, Boston Massacre, Boston Tea Party, and 1st Continental Congress, we write them under the dominoes so the students have a flow chart of sorts. Once the war starts and as we discuss each major battle and event of the war, we add it to a soldier and add the soldier to our timeline. We post these in the front of the classroom so that the students can refer to them throughout the month and really get a good idea of the order in which the events happened. This was last year’s timeline. This year, they are colorful and posted above my white board. I got this pattern from a book about the Revolutionary War. In order to teach each battle of the war, I present a PowerPoint that gives a brief overview of the 5W’s of each battle – who, what, where, when, and why – as well as the result of the battle. This is the most engaging way I have found to teach my kiddos and they always ask if we are doing another PP! Every once in a while, I change it up and instead use more of a “story telling” technique by describing the battle or reading a story book about it. One of my favorites is “When Washington Crossed the Delaware” by Lynn Cheney. This is a beautifully-illustrated, well-written book that gives a tremendous overview of the Christmas Day battles of Trenton and Princeton. My students really enjoyed this book. Afterwards, they had a really good grasp on what happened at these battles. In order to keep track of each battle, we create “Battle Books” – using a piece of card stock folded into a book. Directions can be found on several websites, such as this one: http://library.thinkquest.org/J001156/makingbooks/minibook/index.htm. We actually end up making two and attaching them because there is so much to cover! On each page of the book we write the name of the battle, the date, the people involved, and a 1 or 2 sentence overview of what happened, as well as the result. Halfway through the unit, I have them take their battle book home and teach their parents about the first half of the war. I send home a parent signature slip to verify that they were taught by their child. Of course I include a section for comments, and most parents write a comment about how impressed they are with their child’s knowledge and how much they learned! This is valuable for the kiddos because they are reviewing the information as well as describing it out loud. One parent even said that her child was able to answer all of the tough questions she asked him! Yeah! Do you teach the American Revolution? What is your favorite activity to do with your kiddos for this topic?